Our traditional winter sports, AFL and NRL, have both grown into the “season proper” with ease, with “the early rounds” now just scraps…and it’s still not yet actually winter. The AFL has warmed up enough for us to try and comprehend the possibility that the GWS Giants are going to play finals footy in just their fourth season…and the NRL has thrown up (not on itself, thankfully, but give it time) some surprises with St George Illawarra Dragons and Brisbane Broncos sitting on the top shelf – and Manly at the bottom. For me, the biggest recent highlight has come from that “other” football, soccer (hear them howl “the REAL football”). The A-League has just wrapped up its season, with Melbourne Victory’s victory over Sydney FC being largely overshadowed by Frank Lowy’s tumble from the presentation stage. Remembering the greatest appeal of sport lies in the drama that comes from the unpredictable, Frank’s forward roll with pike and half twist onto his platinum noggin was pure sporting entertainment. No one saw that coming, it was completely out of west field. We know that these days Grand Finals are not only rated on the game itself, but the pre-game entertainment, the half-time entertainment (power-supply permitting) and surely now, the post-game entertainment (over and above the jet powered foil confetti bazookas). 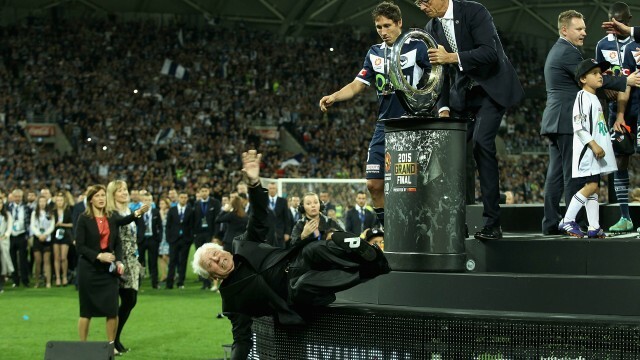 I saw numerous clips from the A-League Grand Final in news reports, but nothing from the game itself created a more memorable moment than the sight of a billionaire octogenarian stacking it big time. Mr Lowy should be the first one picked for next year’s finale. He’ll be 85 and even more prone to a tumble, or maybe an inappropriate comment might be a bit less perilous? A few weeks back, three friends and I went to the SCG and saw the Swans go down to the Western Bulldogs in a thriller in the wet. It wasn’t the result I was hoping for, although I was really happy for my long-suffering Footscray supporting mate, but it was another friend with us that afternoon who got the biggest shock of the day…he went to the food stand. My friend is a generous man at any time and not tight with his money by any stretch, so it was nothing for him to just go order us all a hot dog and some hot chips, but this little exercise blindsided even the well-off him. Let’s just say, he didn’t get a lot of change from $80. I went to the bar a few times and the pain inflicted there gave new meaning to “my shout”. I actually did let out a little squeal on my first visit to the bar (not a girlie squeal, more of a manly, but higher pitched “that can’t be right” grunt). Lesson learned. So here we are, well into the footy season and almost winter. The season that also demands more food than others…perilous times, friends. If you’re going to the game, take the tip: food at the game is not feasible. Pre game – Tiger Beer. First half – Samboy “Atomic Tomato” potato chips. Tiger Beer. Half time/second half – Pizza. Tiger Beer. Post game summary/Man of the Match – Ice cream. Tea. Pre-bounce – Coopers Sparkling Ale. First quarter – Bhuja Nut Mix. Coopers Sparkler. Half time – Slow cooked BBQ beef ribs. A big ballsy Shiraz. Siren/Best on Ground – Lemonade icy pole. Tea. Ashes Cricket (starts early July). First session – Tea. Dark chocolate bullets. Lunch – Vegemite on toast. Tea. Obviously this is a flippant, “more possible than probable” guide, that I will amend or completely ignore, but it’s offered up to me and to you in the right spirit – the spirit of why not? Why not stay dry, warm and financially secure? It’s good to have a plan. Have a go yourself. Maybe build on it, tweak it? Plus, should you give it a shot and get back to me with how it went, I’ll send you the secret recipe for my always well received “Chop Turnout”. Impress your friends and family. Rib-sticking winter grub at its finest. Easy too. Great with or without sport. So, stay home if you can, but if you must, beware going to the footy with an appetite – it could be a recipe for disaster. PS: I hear through the grapevine that Frank Lowy was told the price of a Four’N Twenty just seconds before the A-League trophy presentation…and he’s a billionaire entertainer.